People are frustrated with the financial services industry. There is a lack of trust that has grown from the economic recession and has been maintained in the years following. This figure was up from the previous year. This was five years on from the start of the economic downturn, and recent reports show that the problem is ongoing. The problem with the economic crisis and the ensuing credit crunch led to house prices dropping and consumer confidence dropping to new levels, as well as an increase in unemployment. It should really be no surprise that people are disenchanted with the financial services sector! PWC carried about a study into the problems faced by the financial services industry and found that people have a great deal of apathy with what’s on offer out there. This apathy comes from deep rooted frustrations with the industry. One of the questions that PWC asked its participants in its study was how much they trust different kinds of organisations. 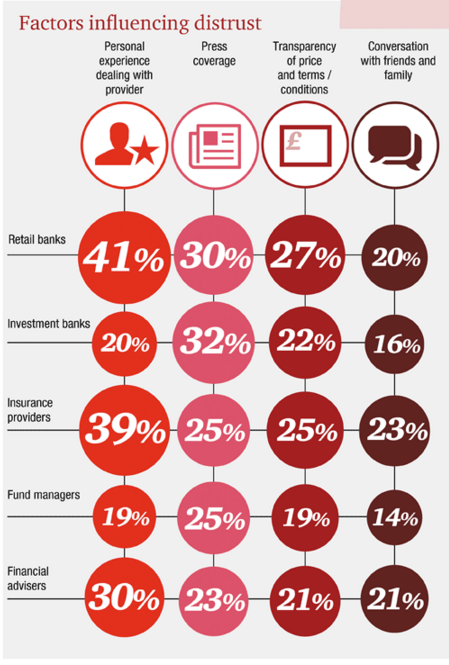 Thirty two per cent of respondents trust retail banks, 28% financial advisors and 27% insurance providers, but when it came to other sectors of the financial services sector, figures dropped even lower – 15% for investment banks and 12% for fund managers. Looking at how that pans out across other sectors, 53% trust the police, 76% trust GPs and 79% trust NHS nurses. 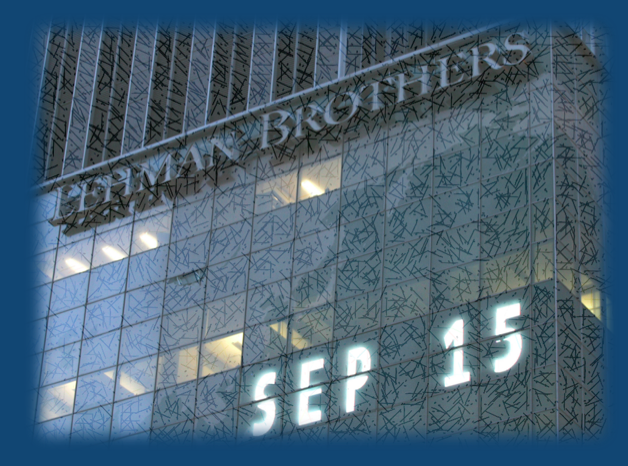 A sorry day indeed for the financial services industry. The problem for the sector is that people see it as “all the same” according to PWC, and this is a problem that the sector needs to break down. One of the ways to do this is to understand the concerns that people feel with the industry. PWC investigated this and found that 37% felt concerned about the fact that they get a very poor return on their savings. Meanwhile, 31% felt that they were overcharged with unfair fees and 30% were worried that the institutions are making money by undertaking risky investments with their money. Others had concerns about personal details being sold to third parties (29%), the security of their account details (25%) the ethics of the business (23%) and the potential for the institute to go bankrupt. The concern is that the industry has not learnt its lesson. That said, the study also found that 49% of those surveyed thought that regulation has been strengthened, which is a positive. What is not so good is that 57% felt that not enough has been done to prevent the same kinds of problems happening all over again. According to PWC’s analysis, the problem is that the concerns run deeper than whether the industry is well regulated or not. There have been particularly damaging media reports that stir up bad feeling as well, which does not help the industry to repair trust in its activities. 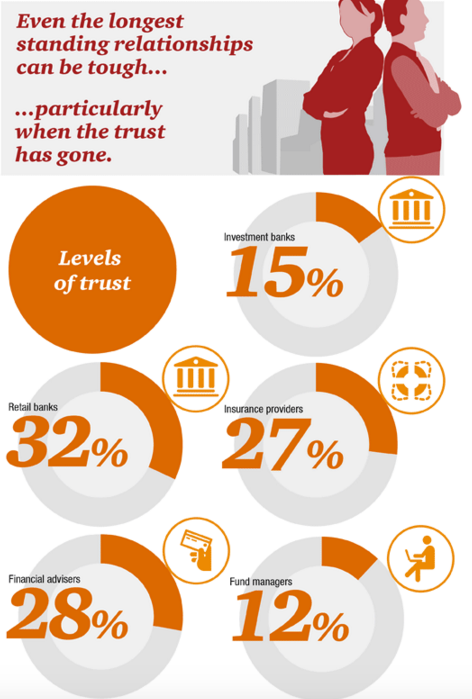 PWC researched the factors that are most likely to influence trust. For retail banks, financial advisors, insurance providers and lawyers and solicitors people’s trust was grounded in their own experience. However, in the case of investment banks and fund managers more people build their concerns based on media reports. This figure was particularly high for investment banks, with 32% of those surveyed stating that media reports have a bearing on their level of trust. For fund managers this figure was 25%. It is clear that the financial services industry is facing a huge crisis of confidence with regard to public trust. The sector has to do something about it if it wishes to win back customers. This is even more urgent as a number of ethical businesses have sprung up in this area, and some customers are moving over to these alternative businesses that appear to have a more trustworthy approach. What can the industry do to win back trust? This will be the subject of Part 2.